Social Equality Minister says Iran is trying to build military bases in Syria and Israel will not allow it. 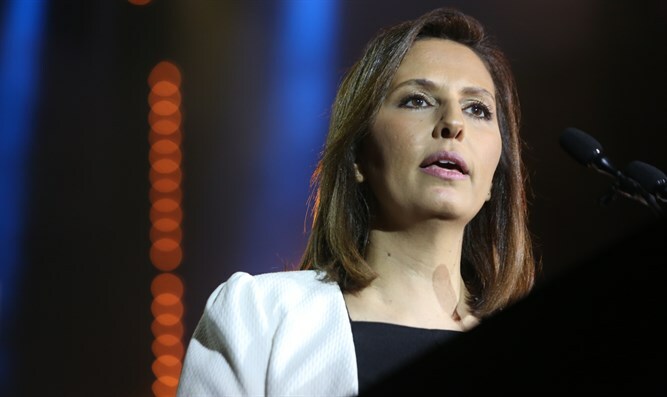 Social Equality Minister Gila Gamliel (Likud), who is attending the annual Jerusalem Post conference in New York, spoke on Sunday about the Iranian threat and the nuclear agreement with Iran. "Israel is a global cyber power and it can turn the entire Middle East into a global technological innovation center. This is our constant response to our enemies, Iran, Hamas and Hezbollah. The Palestinian Authority injects hundreds of millions of dollars every year, 10 percent of its budget that is given to terrorists and their families. This is incitement to killing. This is providing rewards for terrorism: Payment for killing. It must stop once and for all," she said. "Furthermore,” continued Gamliel, “Iran is looking to build permanent military bases in Syria, such as manufacturing plants for precision guided missiles in Syria and Lebanon. We will not agree to this and we will not allow this to happen." “After the agreements with Iran were signed, it became more dangerous and militant to its neighbors. Iran is working with greater force to expand its influence throughout the Middle East, including on the border between Israel and Syria,” said Gamliel. “This is an opportunity to restore the sanctions on Iran. We all hope that this will happen in the next two weeks." Gamliel’s comments come ahead of a May 12 deadline set by U.S. President Donald Trump for Europe to fix the flaws of the 2015 Iranian nuclear deal. On Sunday, Secretary of State Mike Pompeo met with Prime Minister Binyamin Netanyahu and vowed that the White House will reach an agreement to improve the deal, or else the U.S. will withdraw from the controversial agreement. They hoped holding Iran accountable for this could help convince Trump not to walk away from the nuclear agreement. However, they ran into opposition by Italy, backed by Austria.